I happen to agree with a former homeland security secretary who is pushing back against progressive politicians’ call to get rid of the Immigration and Customs Enforcement agency. Jeh Johnson, who ran the Department of Homeland Security in the Obama administration, said that ICE needs to be reformed. To end it completely, he said, would compromise national security, given that ICE is a law enforcement agency. Not at all surprisingly, Donald J. Trump has said progressive politicians favor “anarchy” instead of law and order. Those who holler for an end to ICE only give the president ammo to fire at his political foes. He is at his demagogic best when given such ammunition. Trust me on this, he has been reckless in the extreme in suggesting that anti-ICE forces actually want the country to be “overrun” by gang members, assorted criminals and anyone who wants to do us harm. As Johnson wrote in an op-ed in the Washington Post: “Abolish ICE” makes for a good rallying cry on the left. Demanding the abolition of the Immigration and Customs Enforcement agency also provides President Trump with a useful weapon for bludgeoning Democrats politically. He has said as much, and a good portion of the American public will listen to him. Read the entire Post essay here. If there is a way to make ICE a more compassionate law enforcement agency, then let’s look for that solution rather than an outright abolition. 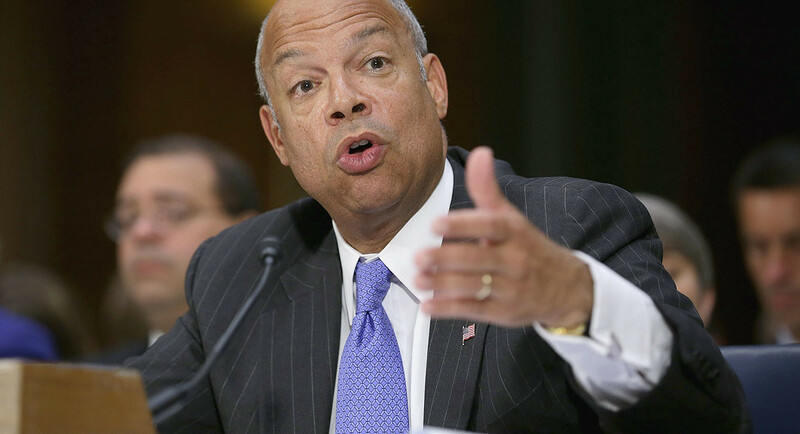 Homeland Security Secretary Jeh Johnson issues a stern warning. International terrorists have become cyber-savvy and are posing a uniquely new threat to the world. Are we on guard against these guys? And what in the world do we do to stop them? “We’re very definitely in a new environment, because of ISIL’s (IS’s) effective use of social media, the Internet, which has the ability to reach into the homeland and possibly inspire others,” Johnson said in a TV interview this morning. The Islamic State reportedly is recruiting heavily through the Internet. It’s also posing serious threats to cyber infrastructure. It’s no longer just madmen with bombs strapped their chests who pose threats to human life. This global war has turned into a battle of wits. This new threat brings to mind something that congressional leaders sought to bring to national attention. I keep waiting to hear from the Texas Panhandle’s congressman, Republican Mac Thornberry, on how we’re defending ourselves against cyber warriors. House Speaker John Boehner tasked Thornberry some years ago to lead a congressional committee that would devise strategies to fight Internet hackers and other enemies who would seek to do serious damage to our cyber infrastructure. When these discussions bring the news to the front pages and gobble up air times on our news networks, I always seem to miss hearing from Rep. Thornberry, who I understand to be an expert on these issues. I trust he’s working behind the scenes. He’s also become chairman of the House Armed Services panel, which is a huge responsibility all by itself. Still, our Homeland Security secretary no doubt can use all the help he can muster in protecting “the homeland” against cyber attacks. Let’s hope this fight transcends the political differences that seem to divide the White House and Capitol Hill … even when it involves national security. The hits just keep on coming at the Secret Service department. Now this: It took the agency charged with protecting presidents and former presidents more than a year to repair a faulty alarm system at the Houston home of former President George H.W. Bush. Let’s see. We’ve had agents frolicking with hookers in South America, a man busting through security at the White House, someone crashing a small helicopter on the White House lawn — and now reports of a failure to respond in a timely manner to concerns about an alarm system at the home of the 41st president of the United States. Vice President Joe Biden’s home in Delaware had its alarm system shut off indefinitely by the Secret Service because it, too, wasn’t working properly. This is getting increasingly difficult to understand, let alone justify. The Secret Service is charged with protecting the highest government officials in the land, namely the president and the vice president. It also protects former presidents and their families. The one notable recent exception to that was the late former President Richard Nixon, who resigned from office in August 1974 and who then hired private security officers to protect him in his family in his post-presidency years. The rest of them, though, get — and deserve — protection from the Secret Service. That the agency wouldn’t repair former President Bush’s home security immediately after its malfunction became known is unconscionable. Homeland Security Secretary Jeh Johnson and new Secret Service director Joseph Clancy have declared security upgrades for those under the agency’s protection to be a top priority item. Why the fixation over labels? Homeland Security Secretary Jeh Johnson got the third degree on Fox News Sunday over that question. His answer: Islamic State terrorists don’t deserve to be dignified by any reference to Islam. I’ve long wondered when this silly argument is going to cease. I’m believing now that it will never end. From my standpoint, it makes no difference if we call these monsters “Islamic terrorists,” or “violent terrorists,” or “garden-variety terrorists.” What matters — or what should matter — is what we’re doing in the field to fight these groups. We’re stalking them. We’re killing them. We’re taking some of them prisoner. We’re subjecting them to serious interrogation. However, it doesn’t seem to be among those on the right who keep insisting that the refusal to label the bad guys as “Islamic terrorists” somehow makes the fight less, well, heartfelt or sincere on our part. I continue to believe our deep-cover agents, special operations personnel, Homeland Security and CIA analysts are doing all they can do to ensure that we avoid a repeat of the 9/11 attacks. No one anywhere can predict the level of success in avoiding another dastardly attack. If we get hit once again, it won’t be because the White House doesn’t hang the correct label on the forces of evil with whom we are fighting a war. We’ll get to see just how partisan it’s going to get in Washington, D.C.
CNN reports that President Obama is going to nominate Ashton Carter as the next secretary of defense. Homeland Security Secretary Jeh Johnson withdrew from consideration. So did defense expert Michelle Fluornoy. Presumably others have pulled out, too, for all I know. Carter is a big hitter. He’s been a deputy defense secretary and was the main weapons buyer for the Pentagon. He also worked as a deputy defense boss during the Clinton administration. He doesn’t seem to be overly political. He doesn’t have a lot of baggage. Carter seems to be a good fit for the Obama administration, which reportedly forced Chuck Hagel to quit as defense secretary after less than two years on the job. However, in this day and time, politics seems to matter the most. Republicans who’ll take control of the Senate in January are likely to find all kinds of things to throw against Carter. The chief among them just might be that he’s Barack Obama’s choice to lead the Pentagon. Senators have said they won’t block national security picks, while fighting other presidential nominees in retaliation for the president’s immigration executive order. Many of us out here intend to hold them to their word. Jeh Johnson has emerged as a favorite to become the secretary of defense. This could be a most intriguing choice, not so much for the job he could get, but for the job he would abandon. Johnson is the current secretary of homeland security. He’s a sharp lawyer and a former Air Force general counsel, which is a civilian post. Defense Secretary Chuck Hagel has submitted his resignation but will stay on until the new defense boss is confirmed by the Senate. The Senate confirmed Johnson as homeland security secretary in a 78-16 vote and he figures to be confirmed for this new post. Ah, but what about the homeland security job? This might cause some serious headaches for President Obama. The Department of Homeland Security is the lead Cabinet agency on this immigration matter, which Obama inflamed with his executive order the other day that delays the deportation for 5 million illegal immigrants. Senate Republicans — who’ll take control of the Senate in January — might see this as their chance to stick it to the president. They could block whoever the president picks to lead the Homeland Security Department. It could get tough, bloody, nasty — which well could be the norm for the remainder of Barack Obama’s presidency. As I’ve said repeatedly, the president deserves to populate the Cabinet with people with whom he feels comfortable. Jeh Johnson is qualified to be the next defense secretary. Barack Obama will find an equally qualified individual to protect the homeland. It won’t matter to those who are angry over the president’s legal and constitutional executive order on immigration. ISIL threat: real or imagined? Here’s my fervent hope for the moment: it is for otherwise responsible members of Congress to quit saying things they cannot prove beyond any doubt — not just reasonable doubt. U.S. Rep. Duncan Hunter, R-Calif., says at least 10 Islamic State fighters have been captured on our southern border. Not so, says Homeland Security Secretary Jeh Johnson. My relative lack of cynicism leads me to believe the guy in charge of protecting the homeland. That would be Secretary Johnson. “Let’s not unduly create fear and anxiety in the American public by passing on speculation and rumor,” Johnson told CNN. Rep. Hunter is feeding the national anxiety over the Islamic State of Iraq and the Levant. Does he have proof that these individuals were apprehended and they, indeed, are members of the monstrous terrorist organization? No. Johnson replies that his agency has seen no “credible intelligence” that ISIL is at our southern doorstep, ready to cross into the U.S. territory and begin its reign of terror on unsuspecting and innocent Americans. There is, though, another way to look at this matter. It is that Border Patrol, Immigration and Naturalization Service, the FBI and local police authorities are on their toes. Suppose they are capturing individuals linked to ISIL. Wouldn’t that mean they’re doing their job? I’ll stick with Secretary Johnson’s assessment that the situation lacks “credible intelligence” to suggest ISIL is on the march in North America. We need physical proof, folks, that this is happening. And I’m not talking about fuzzy photos that Bigfoot believers produce to “prove” the existence of a mythical creature. Let’s deal in reality and forgo the fiction.